I had the most horrible night tonight, and I’m posting this here because I really want your feedback. I’d truly like to know if my experience is simply an isolated case of ignorance or negligence or if this has become the status quo among medical facilities these days. My son Nathan, who is 6, had a terrible nose bleed. I couldn’t get it to stop and it was bad enough that I thought he needed to be seen by a doctor. Now keep in mind, I’m not one of those parents who runs her kids to the doctor for every sniffle and sneeze…he was really bleeding badly. I ran him to the aftercare facility in our area (the closest medical facility to us…the next closest is at least a 30 minute drive) and was told that he couldn’t be seen for another hour when the “aftercare” hours began, but I was welcome to take him to the clinic next door and see if they had any appointments open. I run him next door, only to be told they don’t accept our insurance. (We are military, mind you, living about 30 minutes away from a major military post…Really?) My best bet was to run him to the ER about 30 minutes away. I assess the bleed…yep, still bleeding…so it’s to the ER we go. I get to the ER with my bleeding child and am told to come on back. “Hmmm,” I think to myself “that was a little too easy.” I am taken to a tiny room filled with elderly patients in wheel chairs with oxygen tanks. I’m thinking we were put in the wrong room. Nurses come and go, and for almost 2 hours I sat with my bleeding son and waited…and waited…and waited. The elderly patients started shifting in their chairs, uncomfortably asking one another if maybe they had been parked there and forgotten about. Can you imagine being sick and elderly and feeling like you had been forgotten about in a place you come to for comfort and healing? Finally a tech comes in and takes Nathan’s vitals. It’s been over 2 hours now and she says another nurse will be in to take him back to a room so she can “fast track” him. Huh? Did you just say “fast track”? I’ve been here over 2 hours and NOW you want to fast track him? Seriously? So about 15 minutes later we’re taken back to our cool new “fast track” room where we waited about another 45 minutes. In walks a nurse practitioner and she starts to ask questions. It ended up feeling like we were playing “Guess That Diagnosis”. “I’ll take Sinus Infections for 800..” She outright told me she had no idea what could be wrong with my son and asked me what I thought the problem might be! And I’M PAYING HER FOR THIS! She never even looked up his nose until I suggested to her that she may want to check that out! Wow!!! I ended up with a “maybe it might be a sinus infection but I’m not sure”, some motrin and my discharge papers. I might want to follow up with his pediatrician tomorrow…MIGHT. Is this really what it’s come down to? Is it too much to ask that people actually do their jobs and provide care for my bleeding son, not to mention the poor elderly patients who are probably still sitting in that overheated room waiting to be seen. Why in a country so wealthy and developed are we still seeing caregivers who act as if they are put out to actually have to give care? I am truly hoping that this was an isolated incident and that this is not representative of the quality of medical care being given out all over this great nation. I will never take my children to this particular hospital again, and tonight I will say a prayer for the four elderly patients I had the pleasure of waiting with. Seeing them suffer like that just broke my heart. That’s why they call it “practicing” medicine…they haven’t mastered it yet. There are a million pointing fingers within the healthcare industry and a million more pointing on the outside. Blame poor patient-centric care and skyrocketing costs on the insurance companies tying doctors hands; blame understaffed hospitals for poor bedside manor and ridiculous wait times, blame a lack of federal intervention for not providing regulation and focusing on the broken system within our own country first. At the end of the day, I don’t care about Your problems…just treat me! I’d go on but my blood pressure just spiked. You got that right! 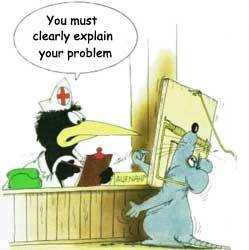 I hate the blame game, especially when it comes to emergency medical care! These people don’t have time to wait for you to decide whether you have time to care for them…they need help NOW! I have a very low tolerance for people who are more than happy to stand around and goof off, talk to their buddies, or (as referenced in my “Books Are For Cavemen” post) text and talk on their cell phones…WHILE THEY ARE GETTING PAID TO WORK! I realize this is another topic completely, but how can someone in good conscience stand behind the desk at the nurse’s station texting knowing there are elderly who can’t breathe or have to go to the bathroom or a 6 year old who’s nose has been bleeding for 2 hours that needs their attention? What kind of people have we become? Where are our standards these days? Useful insights! I have already been trying to find something similar to this for a long time now. Many thanks!